Scot is an entrepreneur, real estate developer and an artist. The first piece I drooled over was this assembly of vintage carpenter rulers. It has a whole different feel when you look at it from afar as opposed to closeup. When I asked where he got this, he just responded, "I made it." Sigh...in awe. Scot and Stephanie collect a multitude of tribal and cultural items. I was quickly drawn to their slingshots from Africa, South America and Asia. As Scot explains, "These were used by the poor, impoverished children to protect themselves from the evil that was around them. Imagine placing a ball bearing in this slingshot...it empowers the least powerful." They are all mother figures, symbols of the protective one, made from wood or antler bone. Scot and Stephanie are attracted, as am I, to the Italian style kitchen. Yet instead of buying the often outrageously expensive Italian cabinetry, Scot shared a picture of the cabinets with a local craftsman who replicated the look for about a 1/3 of the cost. On the wall leading downstairs, you'll notice a grouping of prints in black frames. These are political posters whose originals were once posted on the Berlin Wall. They are all commentary on communism and the social issues that naturally evolve in a communist society- from having your own opinion to pollution, the quality of roads, lack of privacy and good education. 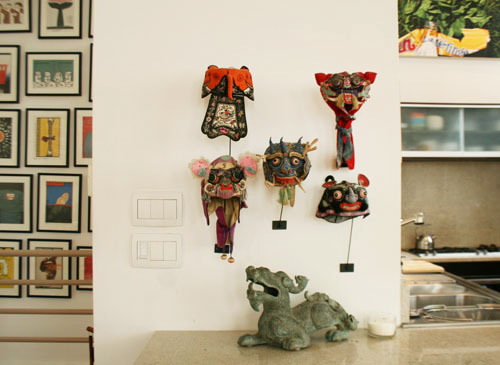 Another collection you'll find in the home are these wonderful Chinese children's hats. They range from 30-80 years old and once acted as protection from evil spirits and bad energy. The detail on these is just incredible and you can spend some time just staring and smiling at their intricate and unique personalities. In this collection you'll find three tigers, a mythical creature and a rat. There is a ton of incredibly smart design in this space but my favorite has to be this kitchen window. From afar, its colors and texture intrigues...and then you get up close and realize it is a collection of metal color slides from the 1930's. As Scot explains, "I collect things that I like the aesthetic of and then create something with them." Using foil tape and a custom made frame, he created this mini masterpiece. I just love it. One's living space reflects their inner being. For Scot, he shares "I like to have a lot of things to look at but clutter bothers me so I'm always striving for balance. I'm also ADD so since all my objects tell a story, it keeps my brain occupied and calm." 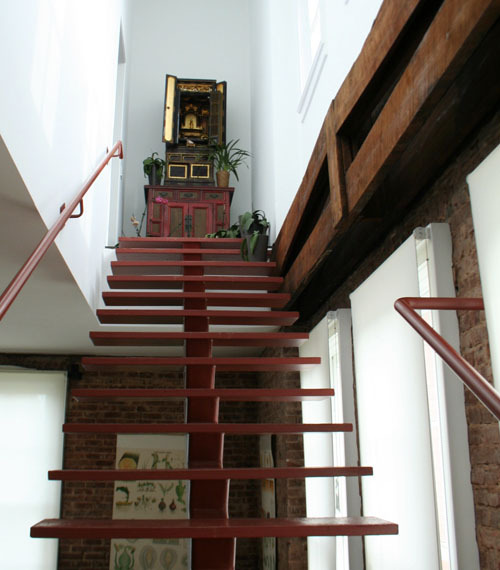 One such piece that offers a sense of peace can be found on the stairway leading to the master bedroom. 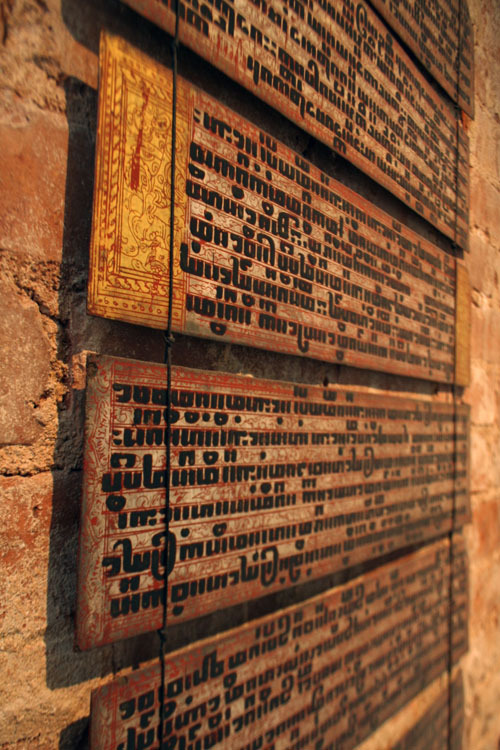 It is here you'll notice a series of bamboo panels with Buddhist text...this is an ancient Burmese bible. Stephanie makes jewelry from time to time and so utilized her skills to string these panels together and display their text in a beautiful, thoughtful manner. Scot inherited these Italian chairs from his parents and they certainly draw your attention and admiration.